This is “West Africa”, section 7.3 from the book Regional Geography of the World: Globalization, People, and Places (v. 1.0). For details on it (including licensing), click here. 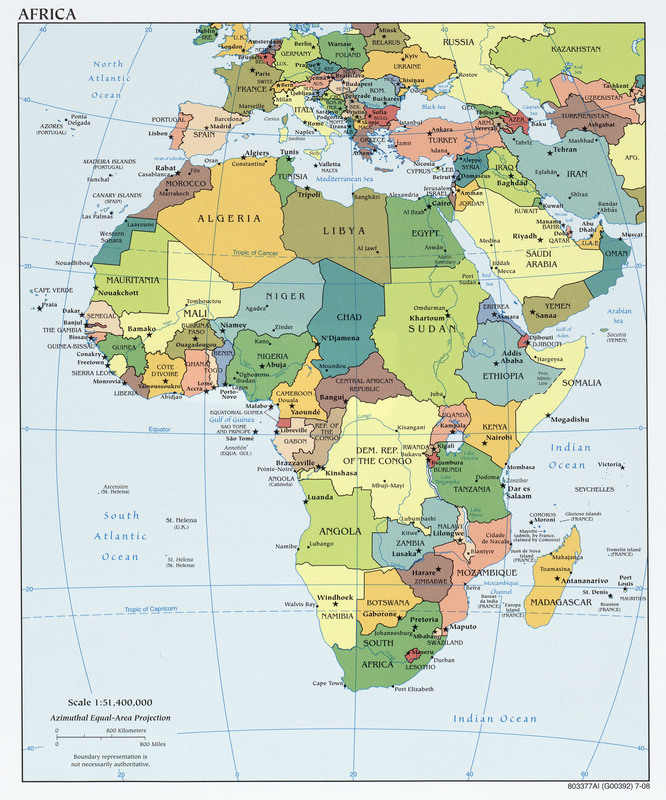 Summarize the main geographic aspects of each country in West Africa. Understand each country’s development pattern and their current political situation. Explain how family size and economic activities are related to population growth. Outline the main economic activities of each country and how they are related to natural resources. The region of West Africa includes the southern portion of the bulge of the continent, which extends westward to the Atlantic Ocean. This region is bisected by the African Transition Zone, which borders the southern edge of the Sahara Desert. The main physical features include the Sahara Desert and the Niger River. The Cameroon Highlands are located on the eastern border between Nigeria and Cameroon. At 4,100 miles long, the Nile River is the longest, while the Congo River is Africa’s second longest at 2,922 miles in length. The Niger River is Africa’s third-longest river and extends more than 2,600 miles from the Guinea Highlands through Mali, Niger, and Nigeria before reaching the Atlantic Ocean in the Gulf of Guinea. Some geographers include the country of Chad or portions of it within the region of West Africa. In this textbook, Chad is listed with Central Africa. The portions of Chad located north of the African Transition Zone share similar characteristics with North Africa. Off the coast of Mauritania are the Cape Verde Islands, which are united as an independent country associated with Africa. Cape Verde was once a Portuguese colony but received its independence in 1975. Western Sahara has been in conflict with Morocco over independence and is most often associated with the region of North Africa because of the influence of Islam and because of its connection to Morocco. The African Transition Zone cuts across the region of West Africa, indicating a division between Islam and Christianity and between the Sahara Desert and the tropics. This diversity in religion and climate is usually exhibited with a north/south division. Islam is the dominant religion on the north side of the African Transition Zone; Christianity is more dominant to the south. The two religions often clash in the areas where they meet. Traditional beliefs and animist religions are also practiced in the African Transition Zone. This map shows the region of West Africa as defined in this chapter. The African Transition Zone crosses the middle of this region. The terms “state” and “country” are often used interchangeably by the world community outside of the United States. Both are meant to refer to a physical unit with a sovereign and independent government. In Sub-Saharan Africa the term “state” is commonly used to refer to a country in any one of the various regions. The former French colony of Niger is landlocked, with the Sahara Desert making up its largest portion. Niger is a land of subsistence farmers, and most of the population lives in the southern regions. The country is less than 20 percent urban. Other economic activities include uranium mining, which is the country’s main export. The world demand for uranium has not been strong in recent years. Oil exploration has begun and international oil corporations have garnered contracts for drilling. The Sahara Desert is moving southward, and the agrarian culture at the base of Niger’s society is often plagued by drought and famine. The Niger River flows through the southwestern region and provides fresh water, but the northern region is mainly the Sahara Desert, and large portions are covered with sand dunes. The country has extreme demographics. Niger has the highest fertility rate (7.6) in the world, and half the population is under the age of fifteen, causing a population explosion that taxes the sparse natural resources and brings even more poverty to a country at the bottom end of the index of economic development. Infant mortality rates in Niger have been the highest in the world. The mainly Sunni Muslim country has a rich cultural base but suffers from economic problems that appear to increase with the increase in population and desertification. Heavy national debt has hindered social services and has required a considerable amount of foreign aid from a number of sources. As a former colony, Niger, France has been a main contributor to providing economic aid along with the United Nations (UN). The political conditions in Niger are typical of the region. For the first thirty years after independence from France, the country was ruled by a single political party and military rule. There have been several coups and various political leaders have been in power. A dispute remains with Libya over its northern border. Ethnic infighting with a minority TauregNomadic ethnic group of the Sahara known for their indigo-colored clothing and use of camels for transportation. group has emerged in recent years, bringing conflict and discord. The Taureg, found throughout northwest Africa in the interior Saharan region, have many ethnic clans and have been masters of camel caravans, often with a nomadic heritage. Their clothing is often made of cloth colored with an indigo dye that distinguishes them from other ethnic groups. The Taureg fought historic battles for an independent homeland against the French during the colonial era. To the west of Niger is Mali, another landlocked Muslim country dominated by the Sahara Desert. Mali was home to various ancient empires. Wealth was historically gained from the mining of gold, salt, and copper. The Niger River flows through the entire southern region, providing a means of transportation and fishing as well as fresh water. The ancient city of Timbuktu, once a port on the Niger River, was a center of commerce and trade for the region and was used by the Taureg as early as the tenth century. Timbuktu has played an important role as an educational focal point for many of the peoples of the region. The University of Timbuktu is noted for its educational activities and comprises various colleges and madrasas (Islamic schools of learning). At one point in its history, it claimed to hold the largest collection of books in Africa. 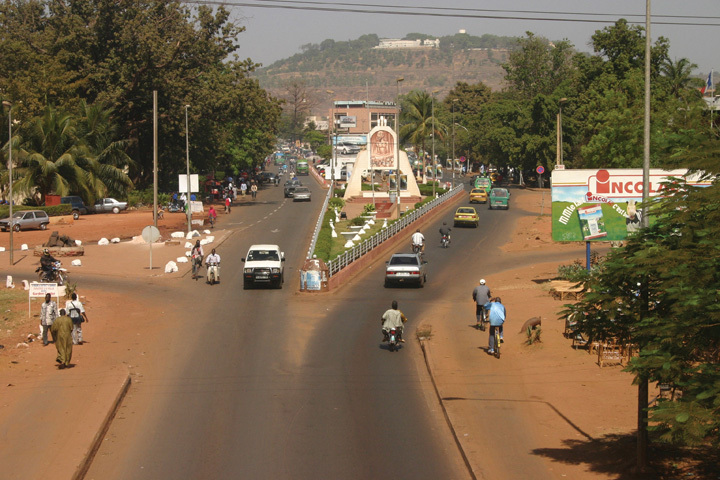 The capital city of Mali is not Timbuktu but Bamako, which is located in the southwest. Timbuktu remains a main tourist destination for the country and the region. Timbuktu (Tombouctou) is a key city for the country of Mali in the middle of the Sahel. The city has been stereotyped by people in Western culture as the farthest place from civilization on Earth. In reality, it is a thriving city that is well connected to the globalization activities of the rest of the planet. It was once one of the wealthiest cities in the world. Gold was plentiful, and the city was home to one of the largest universities in the ancient world. Today the city exhibits traits similar to North Africa but is in the African Transition Zone. Modern technology has found its way into the lives of the people of Timbuktu. International exchanges are providing interesting insights into the globalization process. Even in the rural areas, the people have found innovative ways to share in the international dynamics of global cultures. Dr. Ibrahim N’diaye, originally from Mali and as of 2011 a history instructor at Morehead State University in Morehead, Kentucky, tells a story about his experience while visiting the rural Mali village of Koriyome as a member of the planning committee for the “Tombouctou 2000” millennium commemoration festival the Mali Ministry of Culture was sponsoring at the time. He noticed that in the evening at a certain time, the people of the village started up gas-powered electric generators and then gathered around television sets connected to a satellite feed throughout the village. The evening feature was a Brazilian soap opera called Mari Mar. It was broadcast in Portuguese, a language no one spoke in the village. The seminomadic villagers were totally immersed in the soap opera and had even altered the names of the key characters to match local names. For example, they referred to the main character Mari Mar as “Mariyama” (which is the same as Mari/Mary); Mari Mar’s husband, Sergio, as “Saajo”; the cruel stepmother Angelika as “Jelika”; and so on. Everyone in the village seemed to understand the plot and reveled in the drama of the characters and their exploits. The production became a centripetal force that brought the villagers together in a way that would not have been expected by anyone in Brazil or the United States. Who would have believed that soap operas would have become a method of diffusing global culture to the planet? This story also indicates that human nature is similar in societies throughout the world. This scene shows the various modes of transportation that are common on the road outside Bamako, Mali. Source: Photo courtesy of Robin Taylor, http://www.flickr.com/photos/42993412@N00/72447497. Mali shares similar political dynamics and demographics with Niger and the rest of the region; however, Mali now has a stable democratic government with little political conflict. There are issues with the Taureg in the north and refugees from Ivory Coast in the south, but the country is quite stable politically in spite of the low standard of living and high population growth. Mauritania is also dominated by Islam and the Sahara Desert. Niger, Mali, and Mauritania are the largest of the West African states and together would cover the area of the United States east of the Mississippi River. The term “state” refers to countries with independent governments. Mauritania’s access to the Atlantic coast provided a shipping connection to the rest of the world. For years the country fought over control of portions of Western Sahara but relinquished those areas in 1975. Unfortunately, the political and economic problems that are common in the region are evident in Mauritania. In 1960, the country gained its independence from the French, and a number of political coups and changes in government occurred as a result. Interethnic conflicts exist between the African groups of the south and the Arab-Berber groups of the north. Political unrest and economic hardships continue to add to the challenge of a growing population. Poverty, health care, and education have been major issues that require government support. Foreign aid has been critical to the operation of the country. Large amounts of iron ore make up about 40 percent of the country’s exports. Fishing off the coast has great potential but has been exploited by international fishing vessels; thus Mauritania is in danger of losing revenues and a declining resource base if protection is not secured. Even though the country is largely desert, most of the population works in subsistence agriculture. The Gambia is totally surrounded by the country of Senegal. The Gambia was once a British colony and Senegal was once a French colony. Within certain communities in Mauritania, especially within the Arab Moor group, the concept of female beauty and prosperity was often associated with ample body size. Young girls were encouraged to eat high-fat foods in high quantities and at times were force-fed to put on weight. Being fat was an indication of wealth, and being thin was a sign of poverty and low esteem. This custom resulted in many women being considered overweight and obese by today’s health standards. This trend is not as common today, though it still exists. Many Mauritanian women consider this old-fashioned, and natural eating habits are more the standard. Global views regarding women might be contributing to the country’s current concept of beauty and health. 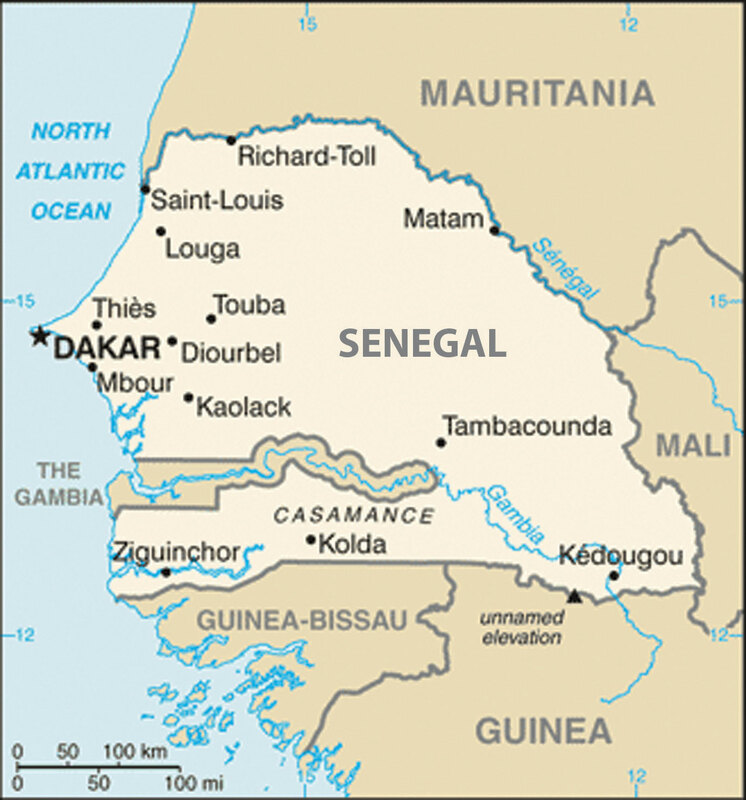 The country of Senegal on the Atlantic coast totally surrounds the independent country of the Gambia. Senegal was a French colony, while the Gambia was a British colony. The Gambia is an enclave of Senegal and extends on both sides of the Gambia River for about 186 miles. It is the smallest country on the mainland of Africa and is about the size of the US state of Connecticut. The two countries of Senegal and the Gambia were united into the confederation of SenegambiaSingle political unit of Senegal and the Gambia from 1982 to 1989. from 1982 to 1989 when it was dissolved. They have kept separate political identities ever since. The capital of Senegal, Dakar, is located on the Cap Vert Peninsula, which is most extreme western extension of the African continent. Dakar was a main colonial port for French West Africa during colonial times. The French influence remains: the common currency in what were former French colonies is the West African CFA franc (Central African franc), which has a fixed rate in relation to the euro. Freeing itself from the grip of Portuguese colonial rule was a hard-fought battle for Guinea-Bissau, which became independent in 1974. The political upheaval that followed up to the present has resulted in various coups, military rule, changes in leadership, and the assassination of their president in 2009. Without political stability, it is difficult to develop a growing economy. Graft, corruption, and civil war have devastated the country’s infrastructure and hindered its economic development, making it among the poorest nations in the world. The country has to depend on outside aid to supply its basic needs. The French colony of Guinea, which is larger than Guinea-Bissau, holds more promise due to its generous natural resource base, but Guinea has suffered the same types of political and economic disasters as its smaller neighbor. Though mineral resources are abundant, there is potential for increased agricultural production, where most of the people make their living. Guinea has a large amount of bauxite and other minerals, including diamonds and gold. The lack of infrastructure and political stability has discouraged investors from helping to develop these natural resources and converting them into national wealth. Sierra Leone has been devastated in the past decades due to brutal civil war and political turmoil; as a result, the country was the lowest in the world on the human development index in 2010. There has been little political stability. Military factions have wreaked havoc on the country since it gained independence from Britain in the early 1960s. After independence, the country’s contested elections and multiple coups resulted in a ban on all but one political party and established military rule. At the core of the conflicts was competition for the control of the diamond industry, which was also a primary factor in the civil war. The abuses of power escalated to a breaking point in the late 1980s, which set the stage for a decade-long civil war in the 1990s. A group calling themselves the Revolutionary United Front (RUF) pushed to take control of the eastern diamond mining sector through terrorist tactics and brute force. Thousands of people died and thousands more were mutilated by having their arms, legs, or other body parts cut off by machetes. Whole villages were destroyed and the residents killed, tortured, or maimed. The government fell under various military coups and eventually resorted to hiring mercenaries to help push back the RUF forces. By 1998 the whole country resembled a military camp with arms and ammunition being trafficked to all sides. There was a total breakdown in state structures and institutions. At various times, there were agreements between the sides in hopes that a stable government could emerge, but the agreements broke down and the country continued to scramble for civility. Nigerian forces were actively fighting in the conflict. In 2000, British troops were employed to help evacuate foreign nationals and establish order. Military forces from neighboring Guinea also entered the country to attack RUF bases. UN forces with US support eventually established a sense of control of the country. By 2003, major fighting was over and attempts were made to establish a civilian government. Approximately fifty thousand people were killed in this civil war and as many as two million people were displaced, many of them refugees. Sierra Leone set up a special court to address crimes against humanity, and the country has been working to establish a stable government and maintain a sense of order. A miner in Kono District, Sierra Leone, searches his pan for diamonds. Diamonds have been used as currency to fund armed conflicts in this region, hence the term conflict diamonds or blood diamonds. The term blood diamonds was first used in the wars in Angola. Source: Photo courtesy of United States Agency for International Development, http://commons.wikimedia.org/wiki/File:Hands_ondiamonds_350.jpg. The diamond trade still dominates and political factions still vie for control. Much of the diamond mining is uncontrolled, allowing considerable smuggling operations to operate. After the civil war, revenues from diamond mining increased from less than $10 million in 2000 to an estimated $130 million in 2004. The civil war destroyed the infrastructure of the country, and most of the resources were looted by forces on one side or another. The economy has had a difficult time recovering. Most of the people make their living in subsistence agriculture. Medicine, food, and goods have been in a short supply. Many people have died due to the lack of these items during and after the civil war. Today the country struggles to recover and work toward stabilization. To fully understand where Liberia is today as a country and as a people, one has to understand its background and its geopolitical history. Liberia has a unique background in that it was not a European colony and was not included in the Berlin Conference of 1884 as a country up for grabs in the scramble for African territory. The conference of colonial European powers who divided up Africa did establish borders for the majority of African countries. Liberia, which means “Land of the Free,” was a destination for freed slaves from the United States. In 1847, Liberia became an independent country patterned after the US government, even naming its capital Monrovia after President James Monroe, the fifth US president. Many of the freed slaves from the United States returned to Africa and relocated to Liberia. The slavery experience in the United States gave returning Africans a different culture and history from those indigenous to the African continent. Assimilation between the two groups was difficult. The division between the Americanized settler communities along the coast and the indigenous Africans of the interior continued to widen over the years. 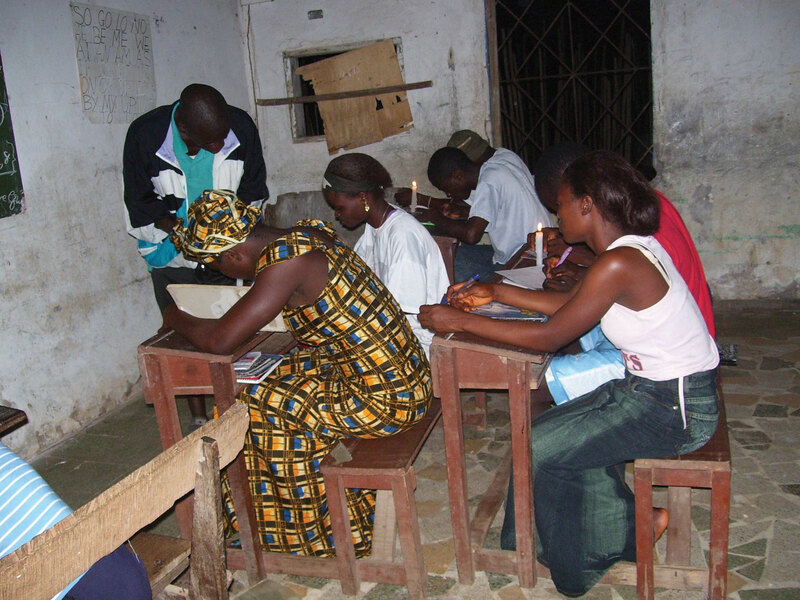 Students in Liberia study by candlelight to catch up on missed time during the civil war. Source: Photo courtesy of United States Agency for International Development, http://commons.wikimedia.org/wiki/File:Liberian_students.jpg. Centrifugal forces within the country surfaced in 1980 when a military-backed coup overthrew the government. This event became a turning point that escalated into social division and political unrest. Elections were held in 1985, which resulted in accusations of election fraud. Successive coups by various factions continued to plague the political arena. By 1989, civil war had commenced. Military forces from the neighboring countries of Ghana, Guinea, Senegal, and Nigeria entered the conflict. Whoever was in charge of the government at any one time had plenty of opposition from the various factions. A warlord by the name of Charles Taylor became a major player and eventually took control of the government in 1997 following a bloody insurgency in the capital. US marines were deployed to protect the US embassy and personnel. Nigerian military troops pushed into the conflict. By 2003, more than fifteen thousand UN peacekeeping soldiers were active in Liberia. The power of the government was reduced to a minimum, and the warlord president Taylor was allowed asylum in Nigeria and later brought before the UN court in The Hague for war crimes against humanity. In the end, more than two hundred thousand people were killed and the country was devastated. With UN troops bringing stability, the 2005 presidential election brought Ellen Johnson-Sirleaf, an economist with a Harvard degree. She became the first elected female head of state in Africa. Poverty and the lack of goods and services have been a persistent problem for the people of Liberia. An agrarian society, few global corporations have made investments because of the long-standing civil war. As was true for Sierra Leone and other African countries such as Angola, the diamond trade helped fund the civil war. Diamonds from Sierra Leone had an estimated export value of more than $300 million annually in 2010. Diamonds from these countries are often called blood diamondsDiamonds used as currency to fund civil war or armed conflicts. because of their use as currency to fund death and destruction. The concept of blood diamonds originated in the civil war in Angola years earlier. The UN banned the export of blood diamonds from Liberia during the war and finally lifted the ban in 2007. Looting and corruption by warlords and military forces pillaged the country’s other resources, leaving most of the population with few opportunities and advantages for the future. The former French colony of Ivory Coast is often referred to by its French name: Côte d’Ivoire. Before independence in 1960, Ivory Coast was one of France’s most prosperous West African colonies. During the 1960s and 1970s, the economy grew, and its production of cocoa beans became the largest in the world. Its coffee production became the third highest in the world after Brazil and Colombia. Ivory Coast is the leading exporter of palm oil and pineapples in Africa. The potential for economic prosperity remains but has been diminished over the past two decades because of the economic downturn in commodity prices and political instability that resulted in a devastating civil war. From 1960 to 1993, the country only had one political leader. Though this brought continuity to the government and the economy grew in the early years, authoritarian rule resulted in civil unrest and dissatisfaction with the conditions in the country. Coups in 1999 and 2001 triggered the beginning of political division. Rebel leaders from the northern part of the country challenged the government’s legitimacy and pushed for land reform and a change in citizenship qualifications. Rebel groups took over the northern regions and vied for control over the prime cocoa-growing lands. Fighters under warlords and militias from Sierra Leone and Liberia encroached on the western sectors to gain a foothold. By 2003, French troops patrolled the western border region to provide security and stability. The country experimented with a unity government, but this broke down when the rebel groups failed to disarm. By 2007 the government and rebel leaders from the north worked out an agreement to reunite the country and dismantle the dividing zone between the north and south. French and UN troops remain to help implement the peace process. Muslims, Christians, and animists are about evenly split in Ivory Coast. An estimated sixty-five languages are spoken here. Family size has been quite large but is slowly decreasing with urbanization. 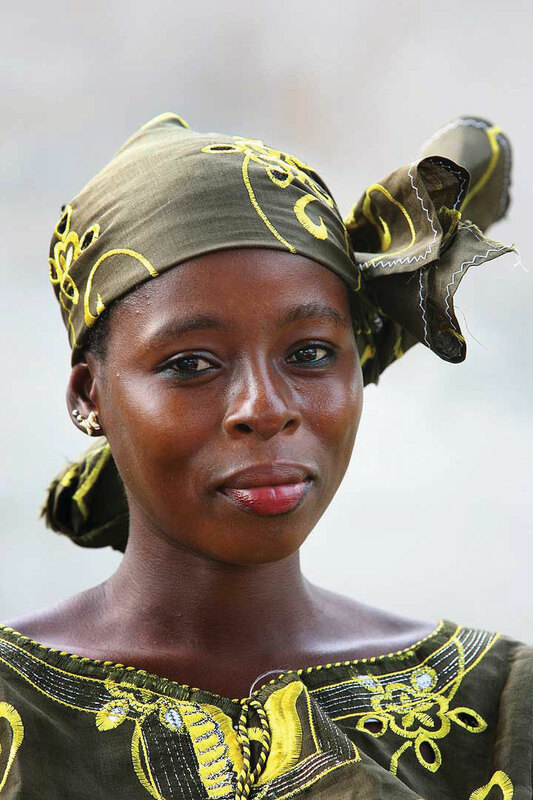 Source: Photo courtesy of Steve Evans, http://commons.wikimedia.org/wiki/File:Ivorian_woman.jpg. The people of Ivory Coast are highly diverse. Religious affiliations are evenly split between Muslim, Christian, and animist. The economic success in agricultural production and recent oil exploration have attracted people from neighboring countries seeking opportunities and advantages. After the 2007 political agreements, approximately 20 percent of the population was made up of immigrant workers from neighboring countries, which are predominantly Muslim. The small percentage of non-Africans are from France, Lebanon, Vietnam, and Spain. There are also a high number of missionaries from North American Protestant churches. Attacks against non-native-born citizens have occurred; qualification for citizenship is a major concern, and natural-born citizens often support stronger restrictions on nonnatives becoming citizens or holding political offices. Named after the former Ghana Empire, the region of the Gold CoastCoastal area off West Africa in the region of the current country of Ghana. was home to the Ashanti kingdom, which thrived on the slave trade. Many of the European colonial powers had sought to build fortified beachheads on the coast and profit from the lucrative trade in slaves, gold, and ivory. In the end it was the British that dominated the region and established the Gold Coast colony. The push for independence came in 1957. Ghana was the first European colony to gain independence in Subsaharan Africa. Ghana remains a poor country, but it is endowed with natural resources. Even with half the population employed in agriculture, the country is experiencing positive economic growth. Gold and other mining operations contribute to the economy. Individual remittances and foreign aid remain a necessary component of the country’s economic well being. Kwame Nkrumah was the first prime minister and the first president. He advocated for a Pan-AfricanMovement to create African unity across the continent. concept that would pull the African countries together, oppose neocolonial activity, and increase trade and interaction within the African community. His ideas were welcome and are still celebrated, but his authoritarian rule brought about his downfall. In 1966, he was ousted in a military coup and exiled to Guinea. The political dynamics that followed were typical of the region: a pattern of corruption, coups, and authoritarian rule. It was not until 1981, when Jerry Rawlings came to power, that all political parties were banned and a new constitution was introduced. By 1992, the political parties were reinstated and the country began to experience political stability and democratic rule, which has endured to the present, making Ghana one of the most stable democracies in Subsaharan Africa. Ghana is a former British colony and was one of the first African colonies to gain independence (1957). Fishing is still a major economic activity along the coast. Source: Photo courtesy of Janet Gross. 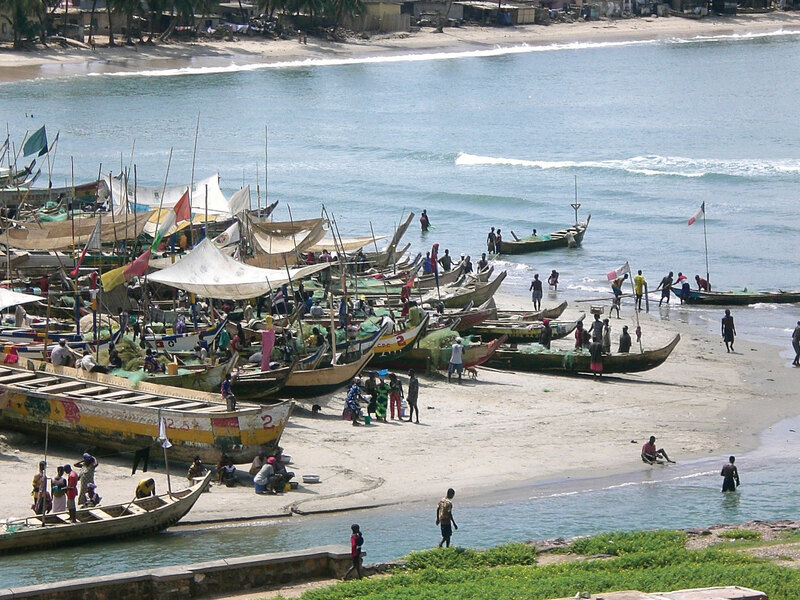 Ghana is diverse in its people and in its physical geography. The physical terrain ranges from coastal plains and interior hills to the large Volta basin in the center. The Volta River was dammed up to produce hydroelectric power, resulting in the world’s largest artificial lake, Lake Volta, which covers a large portion of eastern Ghana. The cultural diversity is exemplified by many ethnic groups, more than eighty languages, and at least double that in the number of dialects spoken within the country. English is the official language and is used in all public education. Funding for education has been available, and the people have access to quality educational services and an increasing agenda of social services. Ghana is showing promise in providing its people with a stable and thriving prospect for growth and opportunities. Upstream on the Volta River is the former French colony of Upper Volta. In 1960, the former French colony attained full independence, and its name was changed in 1984 to Burkina Faso, meaning “the country of honorable people.” Burkina Faso is a landlocked nation without a port city. The country lacks natural resources and has few industries. Subsistence agriculture is the main economic activity for about 90 percent of the population. Droughts and desertification continue because of overgrazing of the land and the natural southward shift of the Sahara Desert. Rainfall varies from forty inches in the south to only ten inches in the north. This is one of the poorest nations on Earth. Political unrest and a series of military coups after independence have not provided stability. The current president has been in power since 1987 and continues to win in presidential elections. New limits may restrict his term in office past 2015. Many people seek employment in the neighboring countries of Ivory Coast and Ghana. This extremely poor nation occupies the second-to-last place on the UN’s human development index. At less than 25 percent, Burkina Faso has the lowest literacy rate in the world. The poor economy offers few resources to increase educational services. Both Togo and Benin were French colonies at the time of independence. The Berlin Conference in 1884 accepted Germany’s control over the coastal region that became Togoland in 1905. After World War I, Germany lost this colony and the territory was administered between the British and the French. The French colony of Dahomey eventually became independent in 1960 and changed its name to the People’s Republic of Benin in 1975. Togo and Benin are both elongated countries with major port cities on the Gulf of Guinea along the Atlantic coast. Benin is about the same size in area as Liberia or the US state of Kentucky. Benin is twice the size in physical area as Togo. The south is a few degrees cooler than the north, where the scrub forests and grasslands of the savanna-type landscape can be more arid, as it is closer to the African Transition Zone. A nature reserve and a national park in Benin’s northern portion attract tourists to see big game animals such as elephants, lions, and hippos in their natural environment. Both countries have a poor economy with most of the people working in agriculture. The political dynamics are similar to other West African states. Africa’s most populous country is Nigeria. The exact population has been difficult to determine, but 2010 estimates report the population to be just short of 150 million. This is a country of more than 250 different ethnic groups with twice that many separate languages or dialects. 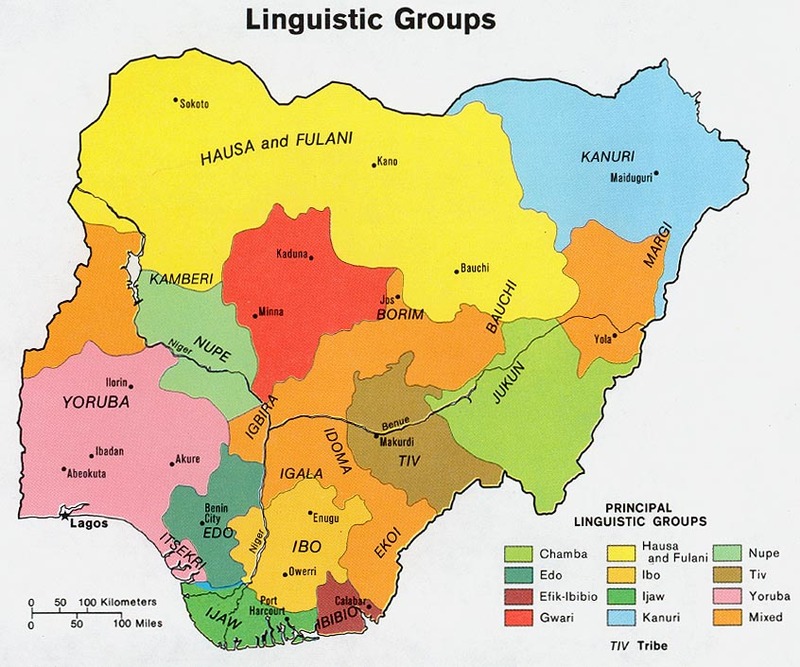 English is the official language, along with Hausa, Yoruba, and Igbo (Ibo), all of which are spoken by ten million people or more. The distribution of the major ethnic groups is illustrated by the different regions of the country. Hausa groups are found mainly in the northern region, Kanuri groups in the northeast, Yoruba in the southwest, and Igbo (Ibo) in the southeast. Ethnic division has also caused serious confrontations and violence. In 1967, a separatist movement in the eastern Igbo region created the independent nation of BiafraSeparatist republic in southeastern Nigeria from 1967 to 1970.. This sparked an all-out civil war that lasted more than two years and resulted in more than a million deaths. Political divisions did not end even after the two sides reconciled and the country was united under the same government in 1970. Political instability in Nigeria has resulted in an almost endless number of military coups and government leaders being removed from office. 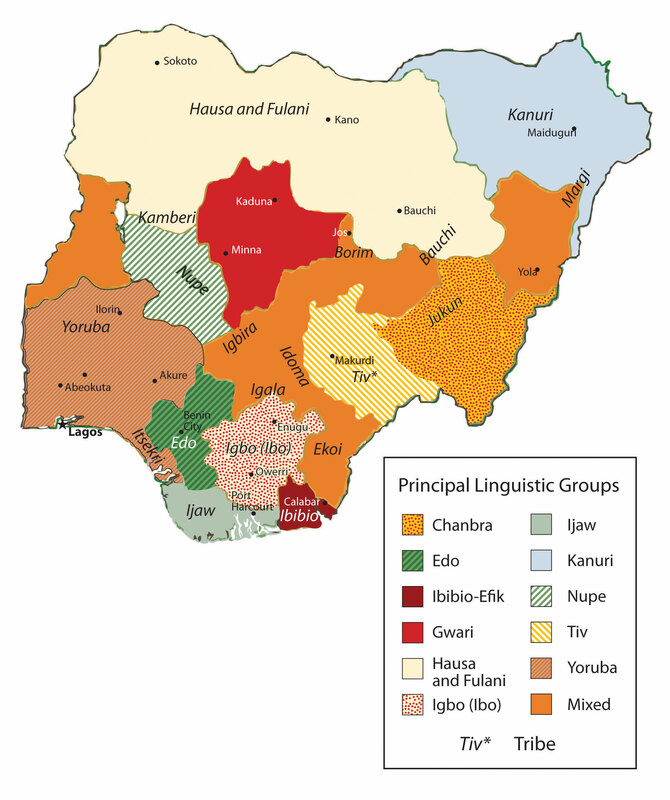 There are many linguistic groups in Nigeria but only four main ethnic groups: Yoruba, Hausa, Kanuri, and Igbo (Ibo), each in the four corners of the country. Map courtesy of University of Texas Libraries, http://www.lib.utexas.edu/maps/africa/nigeria_linguistic_1979.jpg. 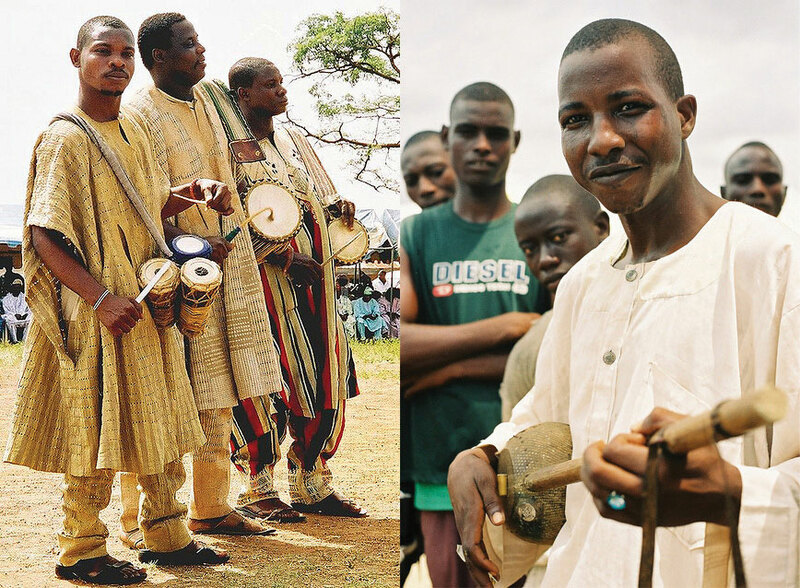 Yoruba drummers perform at a local event (left). A Hausa harpist (right). The Hausa are located in the northwest part of the country, which is mainly Muslim. The Yoruba are located in the south and are mainly Christian. Sources: Photos courtesy of Melvin “Buddy” Baker, http://www.flickr.com/photos/58034970@N00/178631090 and http://www.flickr.com/photos/i_level_news/184542488. The size and diversity of this country create a host of centrifugal forces that can bring about divisions along any number of cultural lines. Religious issues add to the political instability. The north is mainly Muslim, as it is located in the African Transition Zone. The south is mainly Christian. A large percentage of the population follows animist religions with many different traditional beliefs. Clashes have erupted in the streets that pit Muslims and Christians against each other. Several northern provinces have pushed to have the Sharia criminal code made into the area’s civil law. There are regions where it is not uncommon for people to have a mix Christian and animist beliefs. Family size has been large in Nigeria, which has caused an exploding population. Statistically, Nigeria has more people of African heritage than any other country in the world. The population density is equivalent to having half the population of the United States pushed into an area the size of Texas and Oklahoma. Most of the population makes their living on subsistence agriculture, but millions are employed in the growing urban service sector. Nigeria’s main economic engine is the oil industry, which accounts for up to 80 percent of government revenues and is the number one export product. Nigeria is a member of the Organization of Petroleum Exporting Countries (OPEC) and is one of the world’s top ten oil-exporting countries. The lucrative oil business has attracted many seeking to share in the profits. The government’s distribution of oil revenues has brought about even more infighting, corruption, and mismanagement within the political leadership. Rebels and militant groups along the Niger Delta, where most of the oil activity is located, have attacked the oil industry’s infrastructure and taken workers hostage. They want a larger share of the revenues to remain in Nigeria and to go to their people rather than the government or CEOs of international corporations. Poverty, a low standard of living, the lack of opportunities and advantages, a poor educational system, or the lack of social services does not diminish the human spirit. Confronting all these issues and more, the people of West Africa and Nigeria are vibrant, energetic, and hard working and value the institutions of family and religion. Just because they have not transitioned to a consumer society does not mean they cannot find fulfillment and happiness in their lives. A survey conducted by social scientists in 2001 and reported by BBC News in 2003, indicated that Nigeria had the highest percentage of happy people of any country in the world at that time. The status of each country may change from year to year, but the interesting part is that the survey confirmed that money or income level does not always equate to happiness. Countries such as Nigeria, with a low level of per-capita income, can still highly value their heritage and the traditions that revolve around their family and community and transcend the global push for economic gain and the possession of consumer items. Much can be said for the vibrant cultural attributes of the people of West Africa and its developing countries. 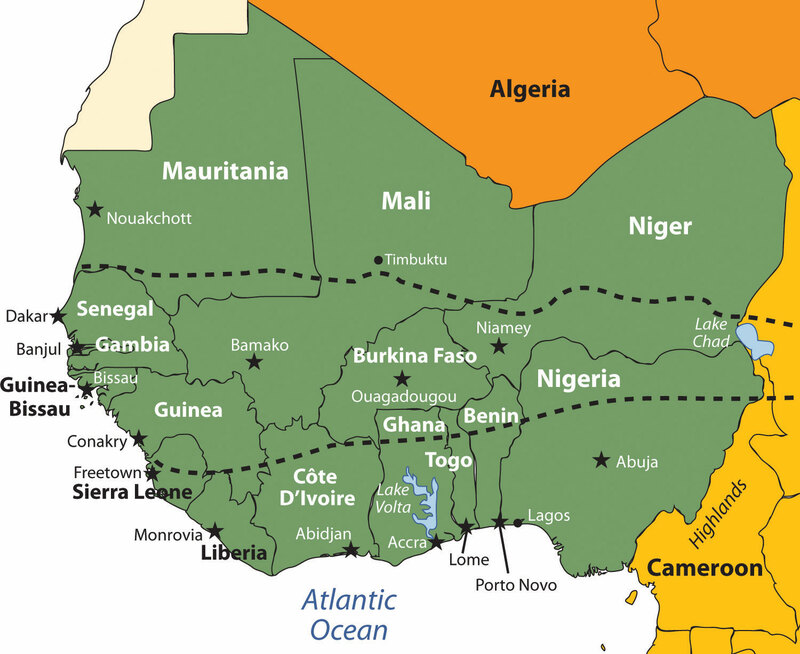 Most of West Africa lies in the African Transition Zone, with portions north and south of the transitional region. Dry, desert conditions exist to the north and tropical conditions exist to the south. The main economic activity in the region is subsistence agriculture. 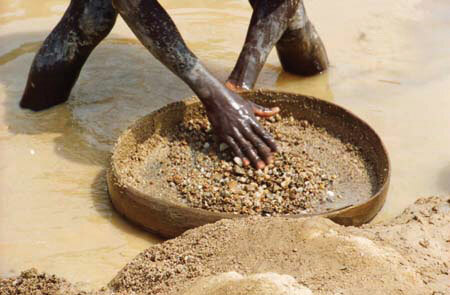 Minerals, diamonds, or oil are also extracted in varying amounts in West Africa. West Africa has a large number of independent states that share similar economic qualities of poverty with rapidly expanding populations. Foreign aid and international assistance have been extensive. The transition from colony to independent nation has not been without serious political conflicts. Bloody civil wars, military coups, and political unrest have plagued the region. In spite of the political difficulties, poverty and the lack of resources, the people of West Africa hold vibrant cultural values that revolve around family and religion. The diversity of languages, religious beliefs, and rich cultural traditions provide an African heritage that is celebrated and valued by its people. What has been the general political pattern after independence in West Africa? Which country has the highest number of ethnic groups? What are the four main ethnic groups there? Why are Senegal and the Gambia two separate countries? What river flows through this area? How do most of the people in West Africa make a living? What are blood diamonds? What two countries in West Africa have had civil wars based on them? How did Liberia become a country? Why was Liberia never colonized by Europeans? With more than eighty indigenous languages, why is English the official language of Ghana? What was the Pan-African concept, and how did it affect West Africa? How have natural resources contributed to the wealth of the region? How will these countries address their high population growth in the future?